U.D.O. 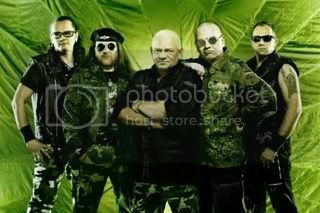 have confirmed that .DAMAGED, the band of frontman Udo Dirkschneider's son Sven, will support the band on their November 11th date in Gunzendorf, Germany. U.D.O. recently announced that their scheduled date on October 29th at Jas Rod in Las Pennas Mirabeau (Marseille), France has been cancelled. Says the band: "Due to contractual problems with the local promoter we can't play the show and therefore we are looking for alternatives. We will keep you updated." A previous update from U.D.O. states: "Norwegian band SEVENFIELD is now confirmed as the replacement for KOBRA AND THE LOTUS for all shows from September 21st (Gdynia, Poland) until November 17th (Bucharest, Romania)." U.D.O. have announced their confirmation for next year's edition of the Wacken Open Air festival, taking place August 2nd - 4th, 2012 in Wacken, Germany. CRADLE OF FILTH were previously announced for next year's festival. Says U.D.O., "U.D.O. are confirmed for next year's Wacken Open Air and the show will be recorded for the forthcoming live DVD! Furthermore there are more surprises currently in the works."